The Bloomsburg area is currently building an Octagon Arena that will be hosting a competition later this spring. The arena will be larger than the one at this past NRL national event in Indy. Any educational team is welcome to participate. The more the better! Please mark your calendars and let em know if there is interest in this event. We have at least six totally new teams in this area that that will be making up the "new team" bracket... others from outside the area can join these teams. We are tentatively planning an April 27th competition in downtown Bloomsburg as part of their annual street fair. The venue is indoors ( www.mooseexchange.org), but right on the main street so teams could enjoy the food and festivities of the event. In addition, the complex has a bowling alley on the lower level which could be fun for teams waiting to compete or to relax after getting eliminated. We are gearing this event to first year teams and those teams that are rather inexperienced. In addition, we are also looking to have an advance bracket open to any teams willing to travel. We are going to formally invite all the RoboBots, SWPA BotsIQ, XtremeBots (Dayton, OH) and Cleveland teams that would like to make the trip east, they will be evaluated and put in a bracket that best fit their teams experience level. I'm hoping to have 20+ teams for this event. Our arena will officially begin construction next week. We are currently waiting for the metal to arrive to begin the fabrication process. I'm excited to see this thing take shape! what are your rules regarding non educational teams entering? is documentation required, or is it the mentality " if it runs throw it in "
All teams that would be planning to attend this tournament will need to be associated with some middle school, high school or post-secondary institution. In other words, you should be in school of some type. If that school does not sponsor a team, you may attend "as a team" from that school. If you are a parent building robots for their kids to drive at the event, then these kids need to have been part of the construction process and should be able to perform all maintenance to that robot at the event. As for the paperwork and documentation. Yes, this will be a requirement. A document does not need to be complex, but it will be needed to verify the students on the team were part of the construction process. In addition, it will show the design process and methods of manufacture. All rules and regulations will parallel the NRL: rule sets. These are very user friendly and common to almost all robot tournaments being held in the United States. We are still plugging away the arena build, but take a look at the event poster and cnsider signing up early so we can make this an event to remember. This tournament will most certainly live up to its hype! What would you consider an inexperienced team? We are hoping to have two brackets, one for veterans like yourself and one for first year teams or teams that have very little experience. The idea is to have the rookie bracket follow the more experience bracket and as the brackets extend out, the winner of the rookie bracket would pigtail into the experienced bracket via the loser bracket. That way a young team can gain experience but also play with the seasoned teams if they prove they are worthy. For those looking to be part of our 2013 tournament, please contact me ASAP so I can add you to the growing list of participants. This is going to be an awesome event! 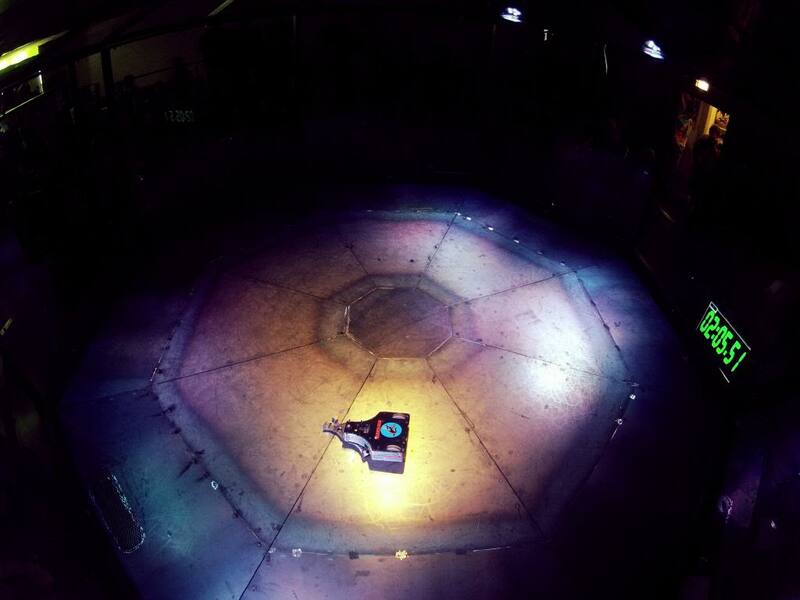 As the regional robot tournaments come to a close, the robot excitement doesn’t have to be the end of the combat robot season … There is going to be a new opportunity for any educational robots teams to participate in the “Rage in the Cage” event that is going to take place in Bloomsburg, PA on April 27th 2013. With financial assistance from the Alcoa Foundation and Beyer MaterialScience, Bloomsburg High School has built the largest octagon arena in the United States. It has a state of the art lighting and sound system which will make each match exciting and unique. In addition, the 2013 event will take place at the Moose Exchange, during the annual Downtown Street Fair, Renaissance Jamboree. This indoor venue will be smack dab in the middle of the street fair. So if you need a break from fighting robots, you can walk outside and grab some fresh cut French fries and a funnel cake! This tournament is being designed for both seasoned teams AND teams with little or no experience. We are planning to run two brackets, one for inexperienced/rookie teams and one for veteran teams. Although, each bracket will have their own set of winners, the inexperienced bracket winner will have the opportunity to join the experienced bracket via a pigtail in the loser bracket. Thus, a first year team could walk away as the 2013 Rage in the Cage champions! Basically, what we are hoping to provide is another opportunity for all teams to either learn from their mistakes or to help teams gain valuable robot experience in a stress free environment. Pennsylvania currently has some of the best robot teams in the nation. This in part, is due to the RoboBots and SWPA BotsIQ organizations. Each of these organizations have contributed countless hours and thousands of dollars to help Pennsylvania schools explore engineering, manufacturing and teamwork. Keep this ball rolling and have your teams re-engineer, fix and get out to another tournament this season. This tournament will not disappoint anyone. 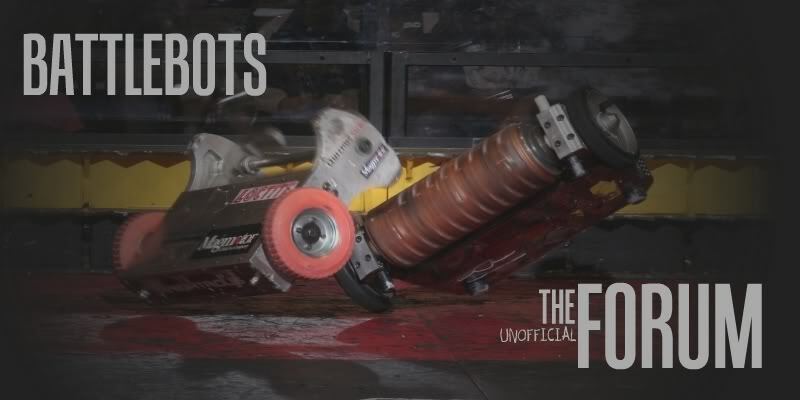 We will be providing some unique opportunities for all teams to showcase their robots unique ability to demonstrate their robot’s destructive side. Fun will be had by all those that attend! Registration fee is $30 per robot team and $20 for each additional robot from the same school. The registration fee will jump to $50 per robot after April 12, 2013 (if you have school approvals to deal with, please contact me so we can work around the deadlines) So please sign up as soon as possible to guarantee acceptance to the tournament and to lock in the low entry fee. If there are any questions or concerns, please contact Kirk Marshall at Bloomsburg Area High School for further information about this event. Hey Mr. Marshall, just a quick question about this new arena, since we will be attending is it possible to know what the dimensions of this new arena are? We've heard complaints in the past about the octagon at Nationals being rather small to drive in so we were just wondering how big this new arena is. Thanks. The octagon arena is 14ft from inside to inside flat. This will be the biggest octagon in the country. The arena in Meadville was basically a 16 x 16 square. That was from the outside to the outside. Which means inside the bumpers. it basically will be the same size from side to side. I have to say their arena is awesome! The arena does look very nice!! These videos and pictures are amazing. After looking at the pictures I had at the event, I didn't get anything as good as what you have. I'm so glad you were able to make the journey over to the event. As I said earlier... you are welcome to join our tournament anytime. We are planing on being there. Should be a good time there too. We need to make it a total PA sweep. Footage is awesome, should try doing similar at nationals.